Asthma and smoking don’t go very well together. About 20%-35% of adult asthma patients all over the world are smokers. A data by The American Academy of Allergy Asthma and Immunology reveals so. Whether you actively smoke or are regularly exposed to second-hand smoking, both factors can trigger symptoms of Asthma. Tobacco smoke contains irritating particles. When you inhale these particles, they stick to the moist lining of your airways. These particles stay there and trigger an Asthma attack. Moreover, the tobacco smoke also damages the Cilia (little hair-like projections in the airways that sweep mucus out from your nasal cavity). As a result, dust particles and mucus are deposited inside your airways. Also, tobacco smoke makes the lungs produce excessive mucus than usual. This further aggravates mucus build-up inside the airways triggering an Asthma attack. 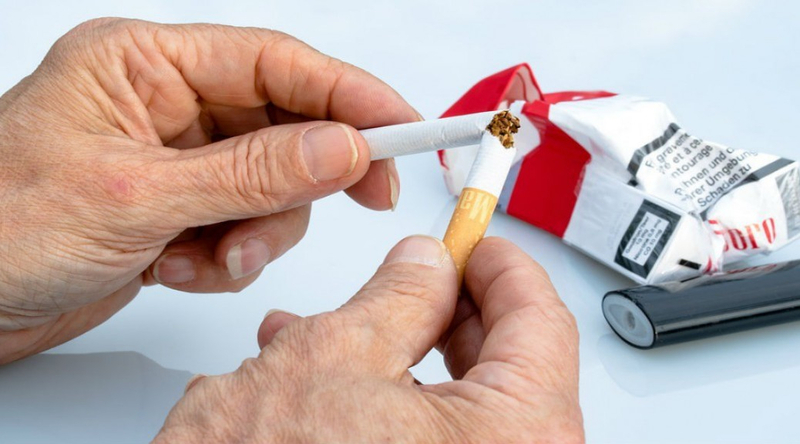 How Can Passive Smoking Trigger Asthma? Passive smoking is when you inhale tobacco smoke from another person’s cigarette or cigar. This is considered even more harmful than active smoking. It’s because the smoke that comes out off the burnt end of the cigarette or cigar, contains more harmful particles such as nicotine, tar, carbon monoxide compared to the direct smoke inhaled by the active smoker. If you already have asthma then passive smoking will cause coughing, sneezing, wheezing, and shortness of breath. Parents need to be cautious about their children as they are at a greater risk of getting an Asthma attack. Children and infants take more smoke into their lungs compared to adults. It’s because their immune systems aren’t developed fully. When exposed to smoke, their lungs produce more mucus and because their airways are still developing and are comparatively small, the harmful particles easily get accumulated and affect them faster. This exposes them to the risk of developing lung infection later in their life. Children born to smoker parents are more likely to develop lung infections and breathing issues. If you are pregnant, then active or passive smoking can affect the unborn child. When you smoke, Nicotine reaches the unborn baby through your bloodstream. Third-hand Smoking: How it worsens Asthma? Third-hand smoke is also dangerous. This is the residue that keeps lingering from the tobacco smoke. When you smoke a cigarette, the chemical contained in the smoke lingers on the surface even months after the smoke is gone. These chemicals react with the pollutants present in the environment and create more harmful substances which can trigger Asthma symptoms. Even when you smoke outdoors, in the smoking zone, the risk of third-hand smoke doesn’t get reduced. Even if you open the windows and switch on the fan on top speed, it cannot eliminate the risk of third-hand smoking completely. The risk of triggering Asthma is more when you smoke in closed spaces. This includes smoking inside the room, cars, and any other closed spaces. It’s because when you are smoking inside closed spaces, you are exposed to a greater amount of pollutants and harmful chemicals. The smoke lingers in closed spaces for a longer period (even if there is ventilation) and is especially harmful to children. How to control smoke exposure? Stop smoking. That’s the most obvious and crucial thing you can do (if you smoke). This is good for you and your family. If anyone in your family smokes, encourage them to quit. This may not be easy but you always have help at hand. Talk to a therapist. Enroll in special programs. • Avoid any situation that may make you want to smoke. For instance, if you have the habit of lighting a cigarette after a meal, avoid that. Instead, take a walk or do the dishes. • If you have an urge to smoke, take a deep breath. Hold it for a few seconds and release. Our BREATHE EAZY tablets combine 15 Herbs and natural ingredients in specific composition to help you get relief from cough and asthma without any side effects. BREATHE EAZY is made as per International standards and is 100% natural.